The 2018 Outer Coast calendar is now available! 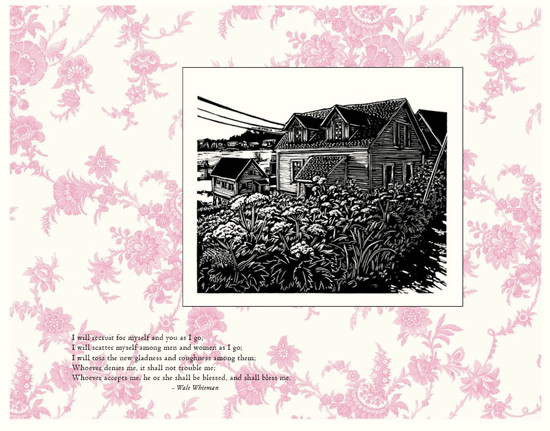 Printed in glorious color on heavy, vellum-surface Natural colored paper by Alaska Litho in Juneau, Alaska U.S.A. 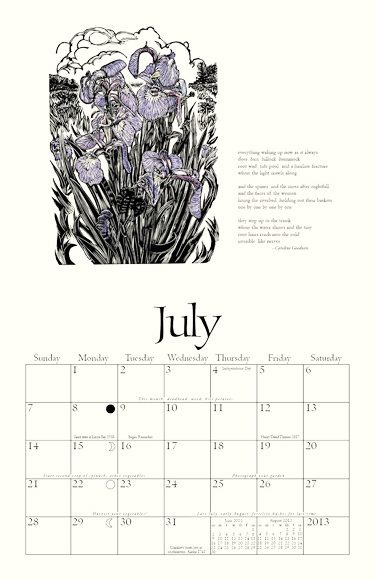 This calendar features my original art, poetry by Alaskans and other greats, gardening reminders for southeastern Alaska, and wilderness anniversaries. It opens out to 11 x 17 inches (8 1/2 by 11 closed), has a handy hole for hanging, and, has complete year of 2019 on the last page. This year’s calendar is built around the theme of courage – having faith in what we know is good, and having a “frenzy for the future”: the faith it takes to work toward making the future even better than today. 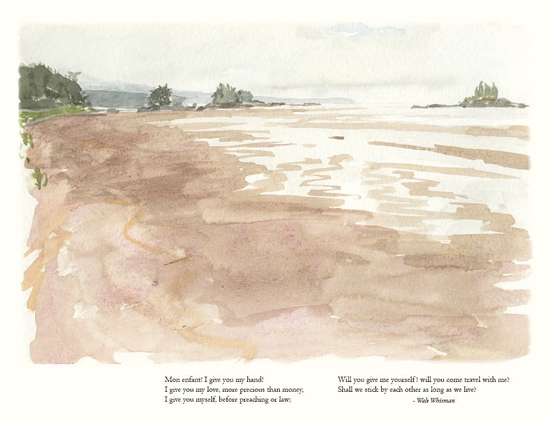 Poetry includes a sonnet by Rainer Maria Rilke from his Sonnets to Orpheus, and some great quotes from Walt Whitman. 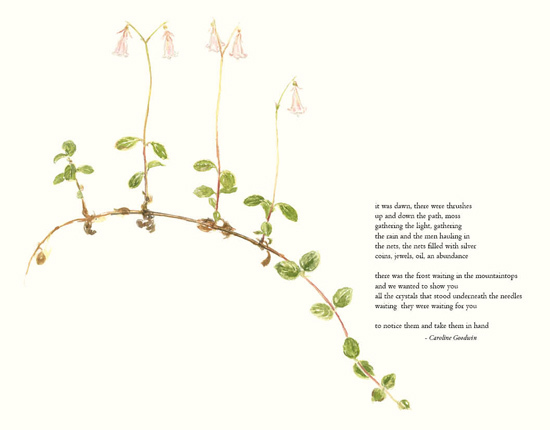 We have two beautiful poems by Caroline Goodwin from her latest book The Paper Tree, published this year (2017) by Big Yes Press. 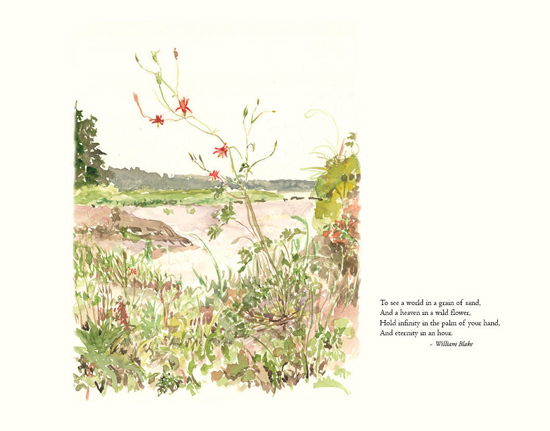 And, a lovely haiku by Sitka’s own John Straley, from his recent book 100 Poems of Spring, published by Shorefast Editions in 2016. 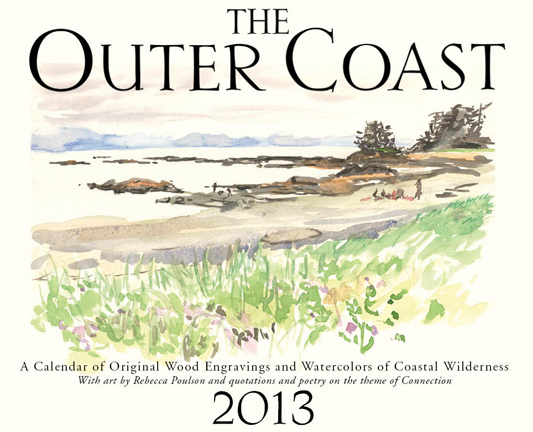 I have been publishing this calendar, The Outer Coast, for a while now, and I think this is the best yet. You can see it all at www.theoutercoast.com. 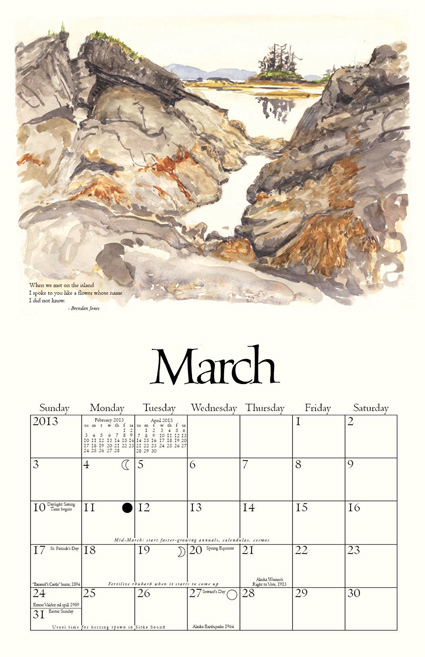 For a long time I had the calendar printed in black and white, then full color. 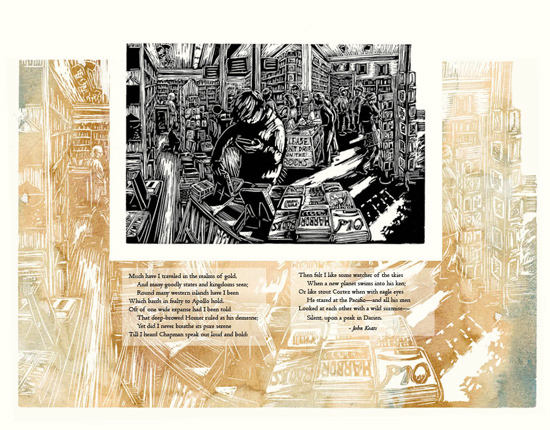 We can’t do full color here in Sitka, so I went to Juneau, to Alaska Litho, and had several pages in color for 2007. It’s a lot more expensive, but there’s no going back – I love it. It’s also cheaper to get color printing done “off shore” as they say, in Korea or China, but I grew up in a print shop, and like to keep it local. The theme this year is Ecstatic Connection to Nature. It started out with learning more about Ed Ricketts, a marine biologist and great thinker, the model for Steinbeck’s character Doc in Cannery Row. He and Sitkan Jack Calvin wrote Between Pacific Tides, published in 1939, one of the first handbooks to group animals by habitat rather than taxonomically (all worms together; all mollusks together; etc.). He was arguably a founder of ecological thinking – he called it Nonteleological Thinking – where instead of looking at creation as a sort of pyramid with Man at the top, we look at the world as being organized and existing for its own sake, and we are merely participants. Great stuff. I wanted some good quotes, but searched in vain: Ricketts is not quotable. 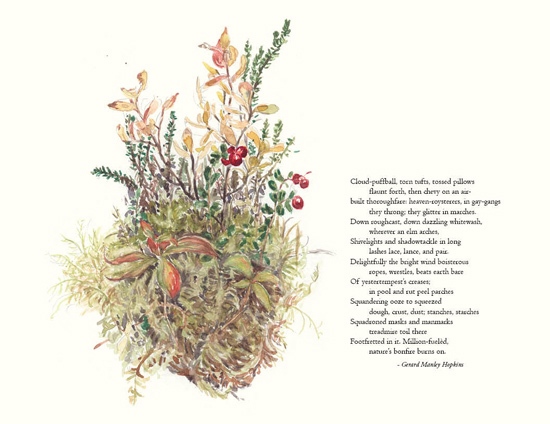 But, my friend Caroline Goodwin had written some beautiful poems, and got me to look again at Gerard Manley Hopkins, who was ecstatic. He finally dropped poetry to become a Catholic monk. The art is all wood engravings and watercolor sketches by me. 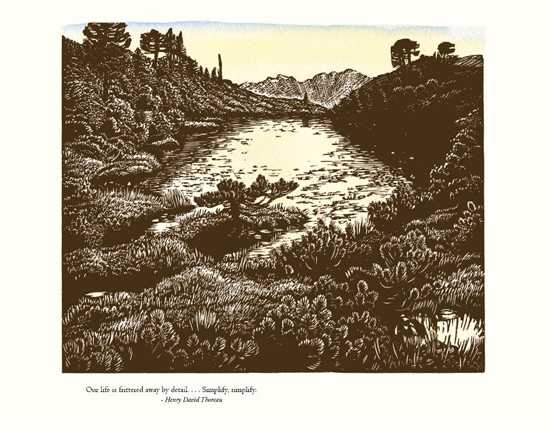 I did two new wood engravings this year, a waterfall and devil’s club. 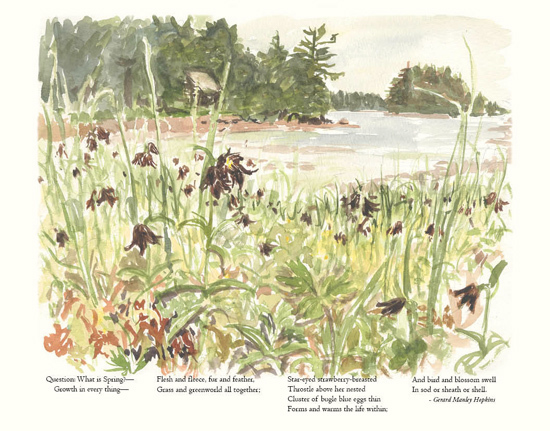 The watercolors are mainly done while at Forest Service cabins or hikes. 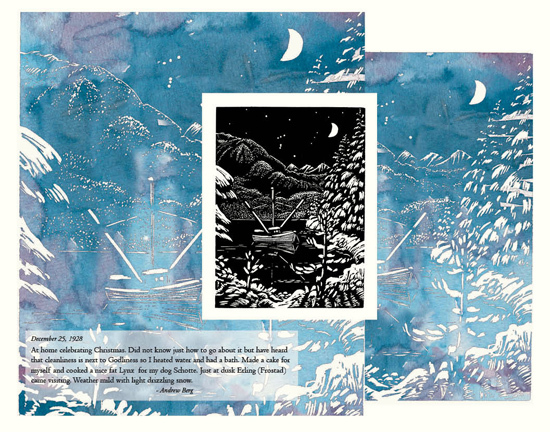 You can buy it at independent bookstores in Alaska, as well as Powells in Portland and Elliot Bay Books in Seattle (stores are listed on my website), or directly from my website (www.theoutercoast.com). On the website I have special quantity deals. So you can get a bunch of calendars at a very reasonable price, and give them to everyone you love, as well as acquaintances, your mailman, babysitter, etc. The gift that gives all year. And beyond, since there is a calendar for 2014 on the last page. And – anniversaries of things like the Prinsendam and botanists’ birthdays; gardening reminders (from an actual gardener, Kitty LaBounty); and moon phases for the Alaskan time zone.